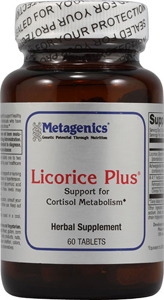 Licorice Plus is a specially designed, herbal adrenal support formula for individuals who are "burned out and exhausted." It features standardized extracts of licorice and ashwagandha combined with rehmannia and Chinese yam. Supports proper adrenal function, which is associated with a healthy physiological response to stress. Features licorice, an herb with an unparalleled reputation for promoting longevity, vitality, respiratory function, healthy immunity and digestion. Also very helpful for acid reflux! Provides ashwagandha, an Ayurvedic herb with renowned adaptogenic properties, that is often referred to as "Indian ginseng." Provides highly valued Chinese herbs traditionally used to tonify kidney "yin" and promote overall health.